Sturgeon Aquaculture – NACEE manual. 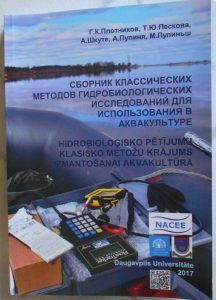 A group of authors from NACEE (from Russia, Ukraine, Poland and Hungary), at the head of Prof. Lidiya Vasilyeva, prepared a manual “Sturgeon aquaculture” [in Russian] under the NACEE stamp. 2. “Collection of classical methods of hydrobiological researches for use in the aquaculture”. A manual for students, producers and aquaculturists. A group of authors from Latvia and Russia , at the head of prof.Plotnikov G. and prof. Skute A. The manual includes main methods of hydrobiological research for both laboratory and in-field use. 3. “Ichtyology basics. Collection of classical methods of ichthyological researches for use in the aquaculture”. A manual for students, producers and aquaculturists. 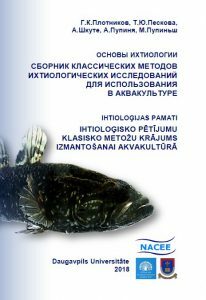 A group of authors from Latvia and Russia , at the head of prof.Plotnikov G.
The manual includes main methods of ichthyological research for both laboratory and in-field use.